There have been some incredible concerts at Café Oto recently. This one lives right up at the top of the list. 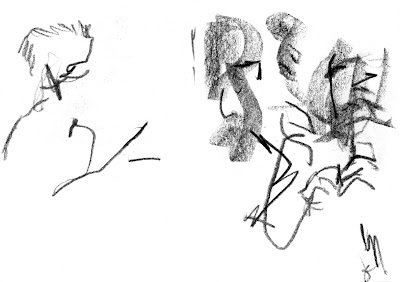 Peter Brötzmann, Steve Noble and John Edwards are frequent collaborators - captured notably on the Oto Roku label's inaugural release - and Brötzmann and the young Chicagoan vibes player, Jason Adasiewicz, have toured and recorded as a duo. This residency and the preceding concert in Berlin mark the first time this quartet have played together, as Brötzmann brought together the rich experience of three different generations to create remarkable cross-currents. The planets must have been in alignment, as everything clicked, musically. Each musician had the flexibility to push the boundaries of expression, yet was stabilised by mutual language and respect. Brötzmann appeared relaxed in the context of a small group, having unburdened himself of the weighty responsibility for his Chicago Tentet, and enjoyed all the possibilities that this particular chemistry opened up. Switching between his signature copper alto to tárogató and a hefty copper tenor, there was no let-up in the intensity of his playing, and he delighted in that of the younger players. Adasiewicz was full of surprises. He had studied to be a drummer for three years before taking to the vibraphone and this background found expression in his overwhelmingly percussive attacks on the bars - fitting in perfectly with Edwards and Noble as rhythmic and textural foils to Brötzmann's melodic initiative. He countered by gliding seamlessly in to glowing passages of rarified, classic jazz vibes, but these were glimpses that just briefly hovered in the air. In this combination there was no room for resting in the comfort zone. The imperative was to continually define and redefine the instruments. A key reference point for Adasiewicz was Walt Dickerson, whose gently experimental sojourns with Sun Ra and his famed recording of poised perfection with Andrew Hill and Andrew Cyrille, opened up improvisational possibilities that Adasiewicz literally took up with both hands - and not just in the Burton-derived four mallet technique, but in his literal manhandling of the bars, which saw him all but rip them right off their cords in a spell of near chaotic abandon, with audience members offering hands in support as he threatened to topple in the frenzy! Noble and Edwards demonstrated their world-class credentials with a breadth of technique and responses that drew out the best in their counterparts. Noble's 'machine drum' ripostes to Brötzmann's incrementally intensifying crescendos and his use of hands, mallets and dextrous chimes painted a rich percussive field, spiked with an alternative melodic sensibility. Edwards combined characteristic hyperactivity with attention to the smallest detail to fill out the overall sound with thrashes and plucked and tapped interventions. His subtly applied pulses lent a gentle anchor and composure to the twists and turns along their audaciously improvised route. Brötzmann finally took up his tenor, roared in to view and drove the sax with an unstoppable flow, showing unequivocally what the instrument is capable of, and as a prelude to the final push combining embellishments, clatters, fills and bursts from all angles and a swinging jazzy inflection momentarily bubbling beneath the surface. "It was, for us, a great adventure," pronounced Brötzmann at the conclusion, in his heartfelt thanks to Café Oto for hosting the performance in surroundings he feels so much at home in. A truly special concert - quietly contending for gig of the year - or the decade! Café Oto captured it, will they short list the recording for their own label?